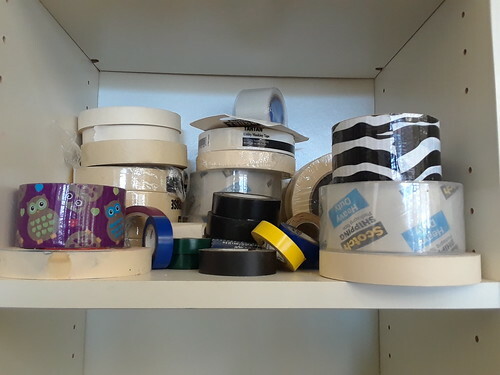 You are currently browsing the tag archive for the ‘Maryland’ tag. 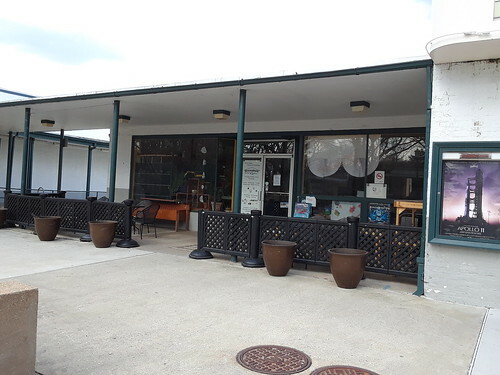 In 2013 a married couple named George Boyce and Eva Fallon had decided to take out a lease on a space at Roosevelt Center in Greenbelt, Maryland that was previously occupied by a dry cleaning business. 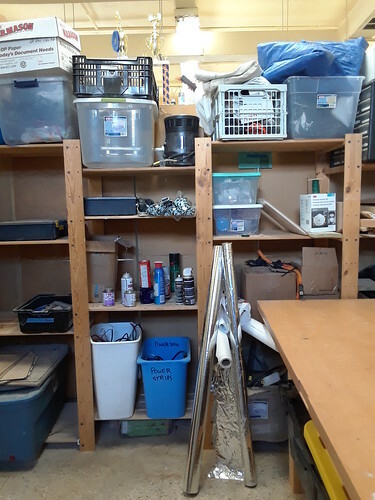 (That business—which had been operating for many years—had closed down permanently about four or five years earlier and the space had remained empty until George and Eva took it over.) 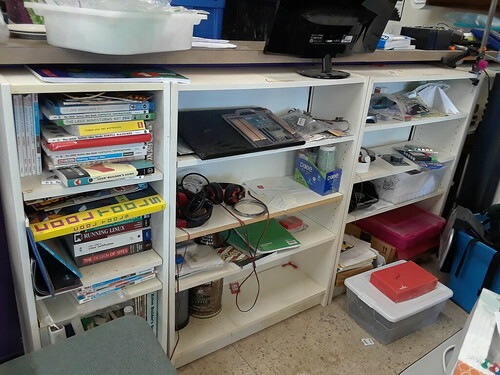 They had an idea of coming up with something that was completely different—a makerspace. 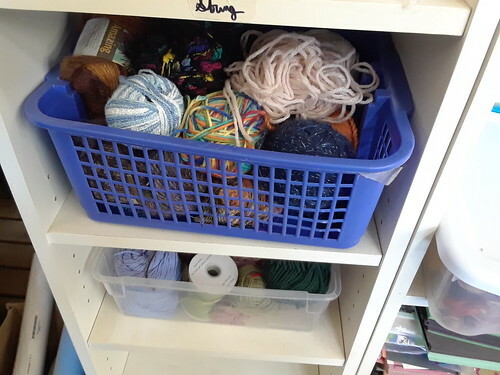 It would be a non-profit place where people would gather and make things. 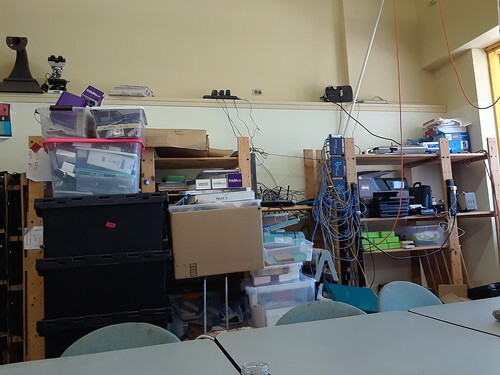 When I first met them while they were still renovating that old dry cleaner space, the only makerspace I knew of was Fab Lab DC and that was because I had attended the day-long Summit of Awesome conference there back in 2012. Once the place was opened in 2013 I was totally impressed. 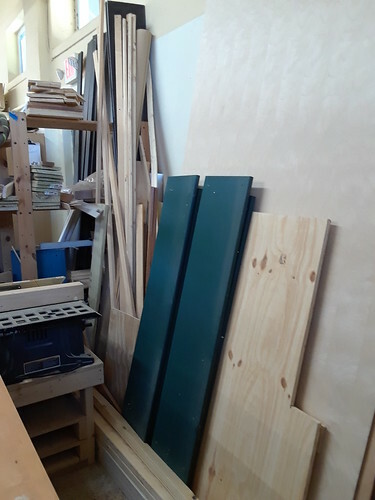 That was the start of my association with that place, which was originally named Club 125 (after the address of the space at 125 Centerway), then subsequently renamed Makerspace 125 until it was renamed again as the Greenbelt Makerspace. 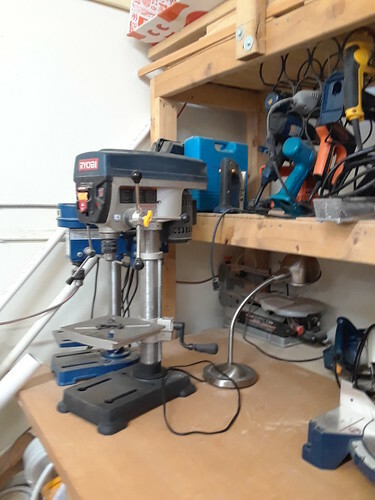 The Greenbelt Makerspace strived to offer facilities for people who want to experiment with trying to make something new but don’t have the proper tools needed at their home while also providing a social atmosphere. 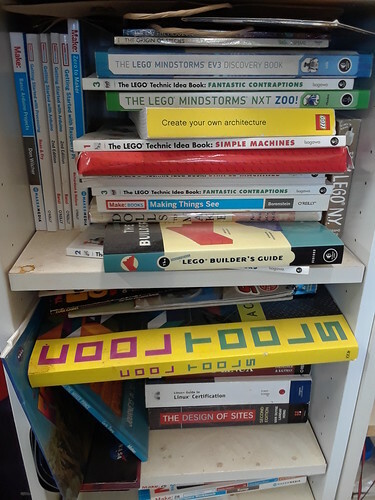 In the six years that this place has been in existence I’ve seen kids form the local First Lego League, girls form an all-girl robotics club known as the Labradoodles (named after the fact that George and Eva owned a labradoodle dog named Sam), people getting seriously involved with playing Minecraft, volunteers running a day-long Repair Cafe every few months (where people can get various items—ranging from sewing to a broken electrical item—repaired for free instead of just throwing it away), and other volunteers run a day-long “Build Your Own PC” workshop where participants could take their built computer home, one person trying to develop his own action figure prototype, other people trying their hand at 3D printing, and even a group of people who were trying to remodel the interior of a van. In addition the Greenbelt Makerspace became a place where people could just hang out and socialize whether it was through a regularly scheduled weekly event (such as the weekly Fiber Fans meetup for knitters/crocheters/sewers) or through a monthly event like Fermentation Fans (where people could try all kinds of homemade fermented food and drink) or even if there was nothing scheduled but two or more people just wanted to go inside and socialize for a bit. 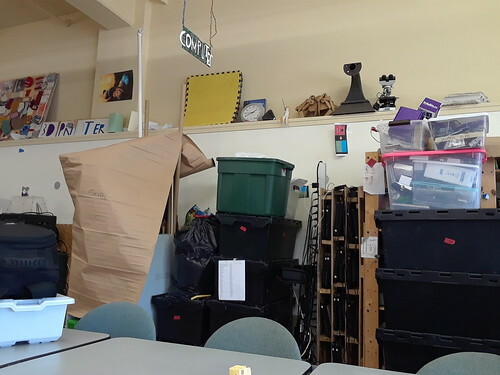 The biggest hurdle of this makerspace was money, which was needed to pay expenses like rent and utilities. 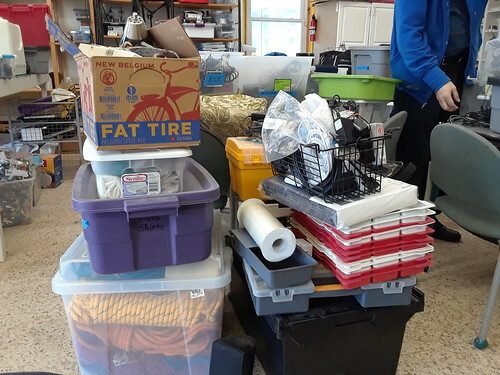 George and Eva spent a huge amount of time writing grants to various organizations in an effort to raise enough money in order to keep the makerspace a functioning community-based nonprofit organization. 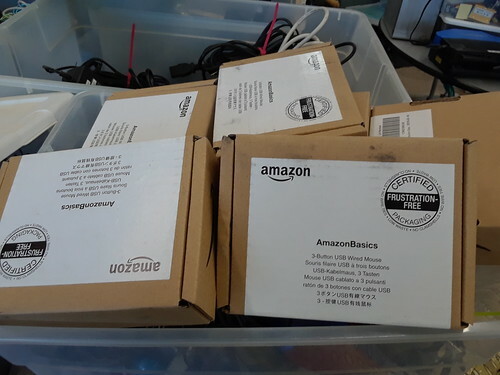 George and Eva soon found a funding source when they started to run a series of week-long tech-oriented daytime camps for children and teens in the summer. 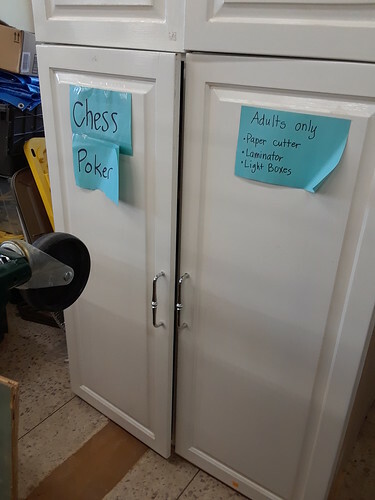 In fact, they made so much money running those camps that they were able to keep the makerspace afloat for the rest of the year and early into the following year. 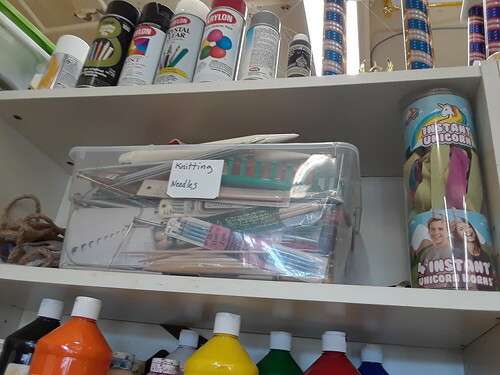 They were so heavily involved in keeping the makerspace running that they soon became the public face of that makerspace. 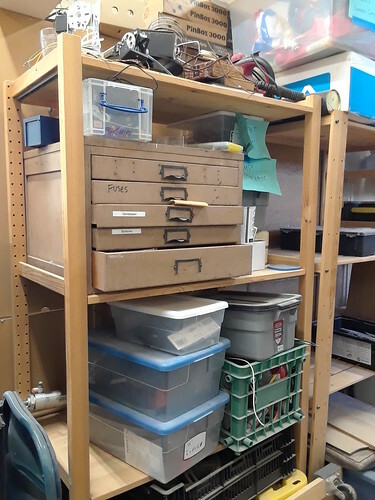 Eva was already retired when the makerspace was first opened but George eventually retired from his day job as a NASA contractor about a couple years after the makerspace opened so he could devote more time to that makerspace. George even attempted to run for the Greenbelt City Council twice but he was defeated at the ballot box both times. 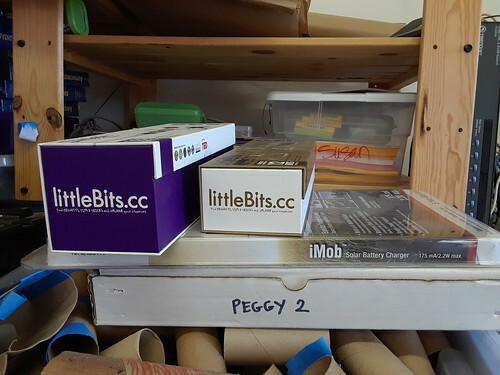 By 2017 George and Eva decided to move away from the two of them running that makerspace in favor of a cooperatively run non-profit complete with a board of directors. 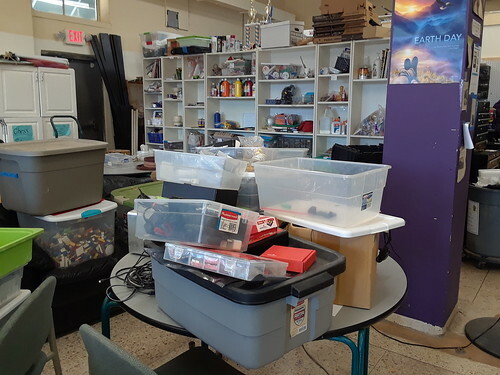 People could buy into owning a portion of the makerspace for just $20 a year. I ended up taking out a membership because even I could afford paying $20 despite my financial struggles at the time. But in 2018 George and Eva announced that they were moving to Vermont in September after the Greenbelt Labor Day Festival. 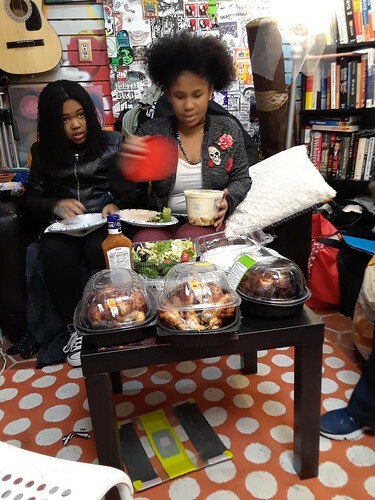 One of Eva’s relatives had died earlier that year and they had a desire to live closer to other members of Eva’s family, who all lived in the New England region. 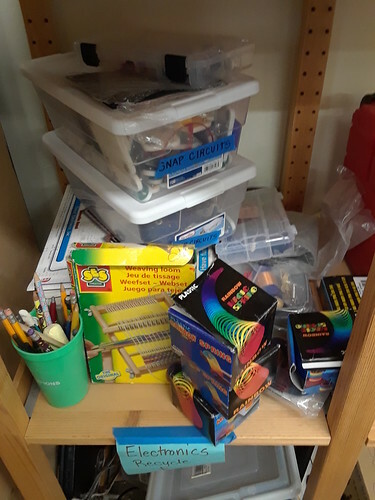 I went to the first membership meeting that was held after George and Eva moved and I learned that the makerspace only had enough money to last them until the spring unless they find another source of funding. 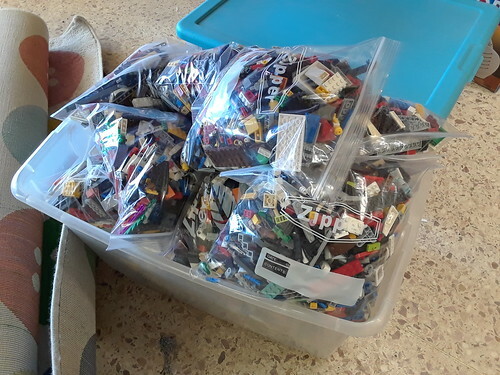 Well March came and I found out that the makerspace was about to run out of money. 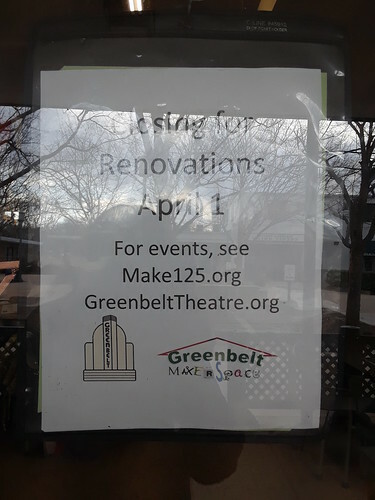 Meanwhile the neighboring Greenbelt Theater needed to make some major renovations to its HVAC but had to deal with a closed theater (along with lost income) while the renovations were going on. 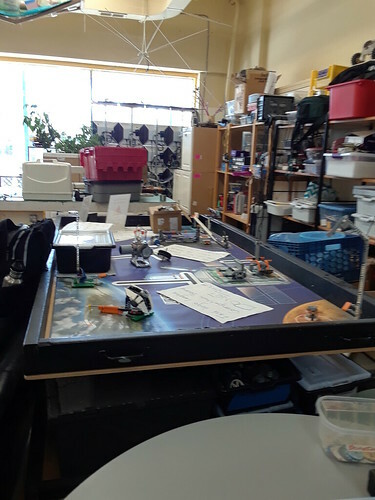 So the makerspace board of directors and the Greenbelt Theater got together and they decided to let the Greenbelt Theater take over the Greenbelt Makerspace’s current space. 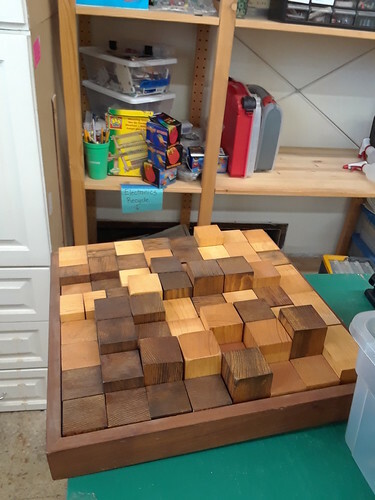 You can learn more about this arrangement right here. 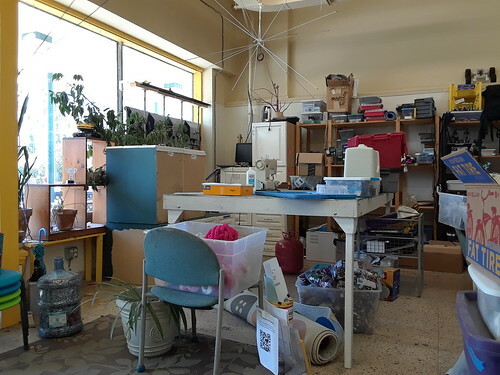 Anyway the Greenbelt Makerspace had to move out by April 1. 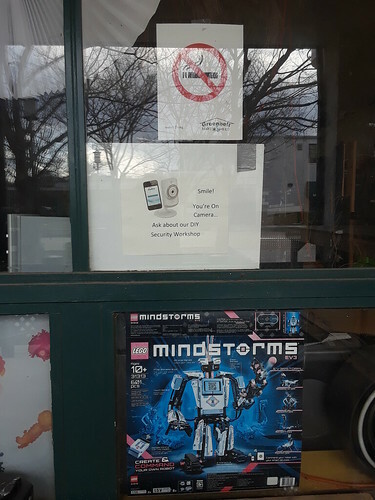 I learned about this official announcement when I was attending the weekly animation meetup that was held at the makerspace on St. Patrick’s Day. 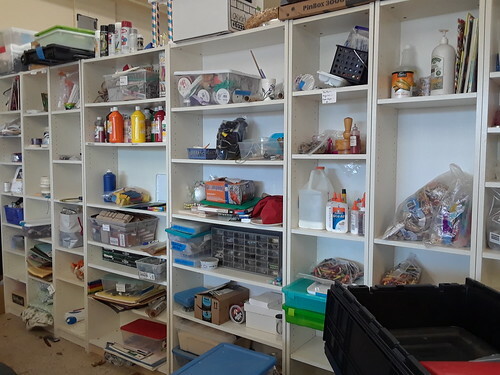 Basically there would be a clearance sale at the Greenbelt Makerspace on March 31 while some items would be transferred to The Space, the other nearby makerspace that’s located inside of Beltway Plaza Mall. At that point I took out my smartphone and started taking pictures of the entire facility for posterity. 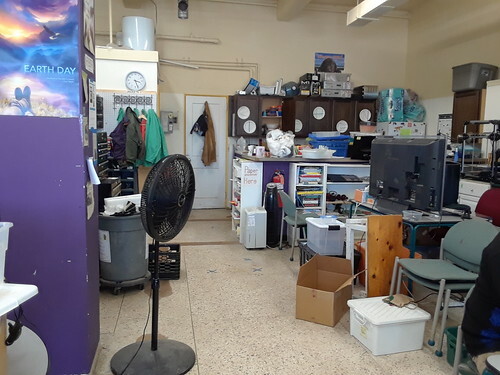 Here’s the front of the makerspace, including the door and windows. 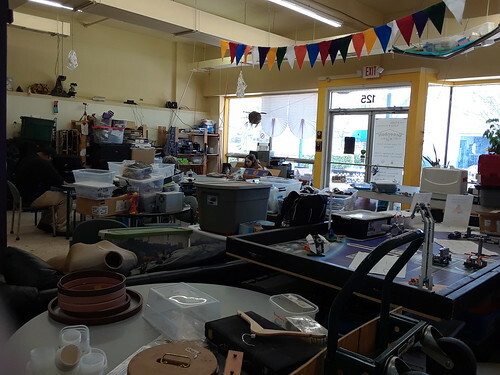 Here are a few wide shots of the interior of the Greenbelt Makerspace. 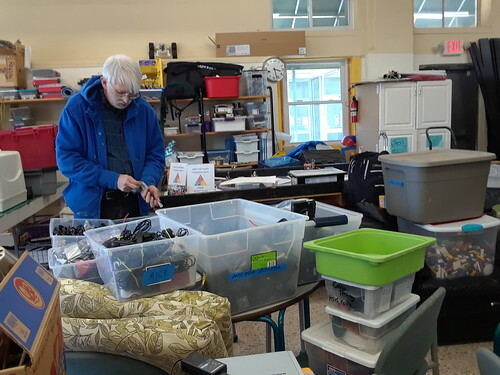 A volunteer looks over and packs up the inventory that would either be sold at the March 31 clearance sale or sent over to The Space. 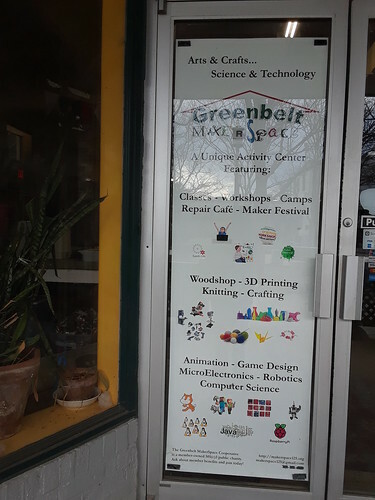 Like I wrote earlier, I learned about the Greenbelt Makerspace’s imminent closure during the weekly animation meetup that I’ve been attending for the past two years. Pictured is Ola Betiku, who founded the meetup and has been running it the entire time. 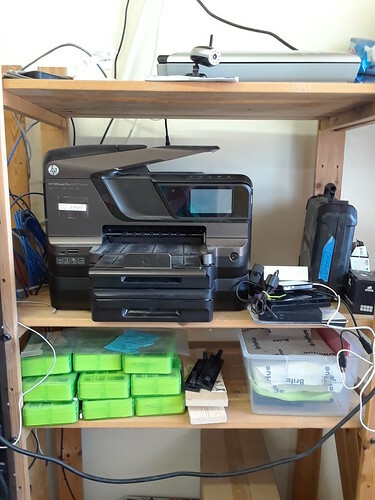 Here’s a look at the 3D printers. 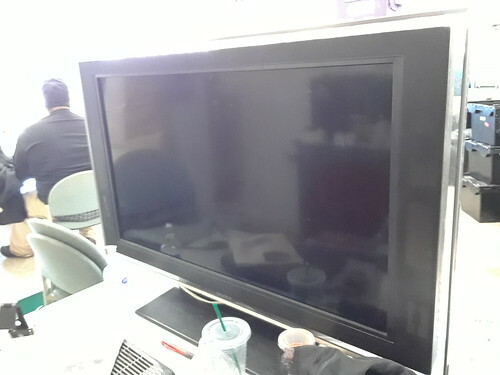 Here’s one of the big screen monitors. 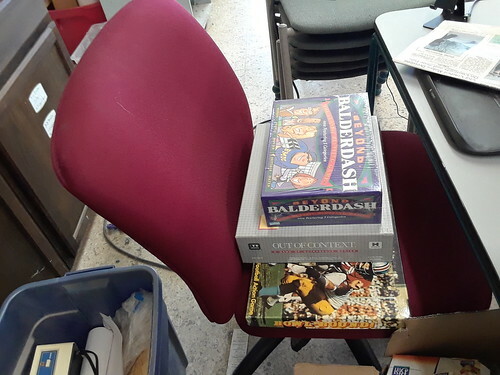 Just a few of the board games that were available for people to play, especially during the monthly Board Gaming Night that was held there. 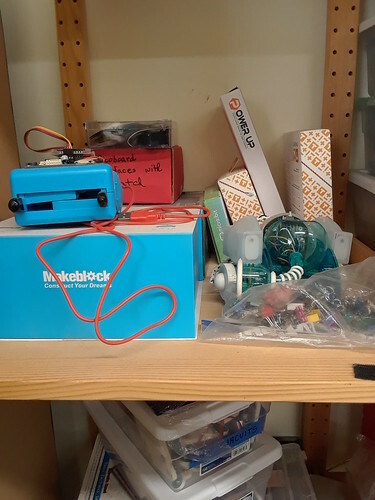 There was more to the Greenbelt Makerspace than just computers and robotics. 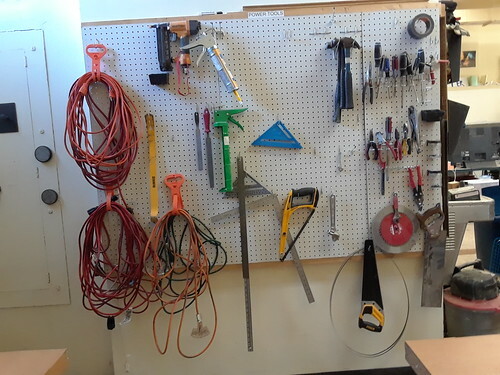 There was a section that was devoted to sawing, welding, and other types of hands-on projects that one could make with various hardware. 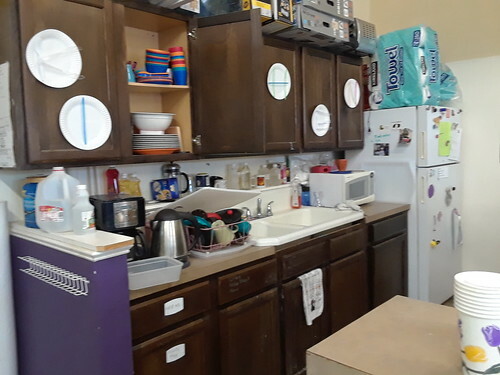 Pictured is a small kitchen area with cabinets, a sink, a refrigerator, and a microwave oven. 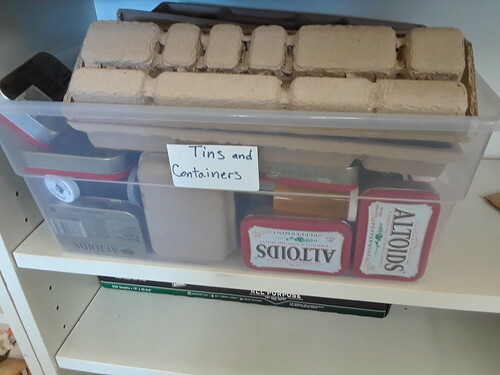 The only thing that was missing was a regular oven with a stovetop but, otherwise, it was a place where one could microwave a quick dish or store food and drink. 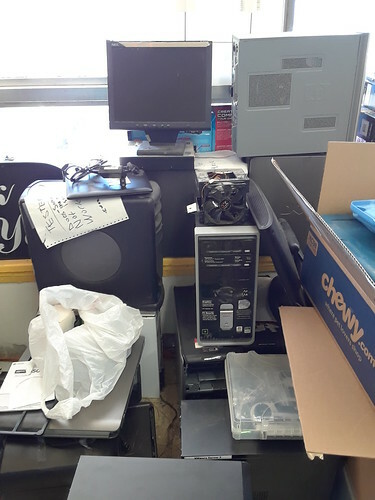 There were numerous books and various electronic and computer parts stored everywhere. 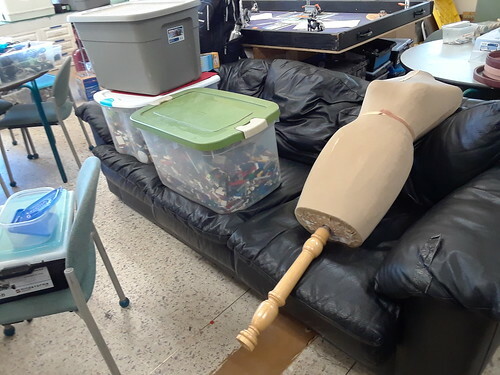 There were plenty of non-computer crafty parts that were also stored at the makerspace, such as this dress form and tubs full of Lego bricks. 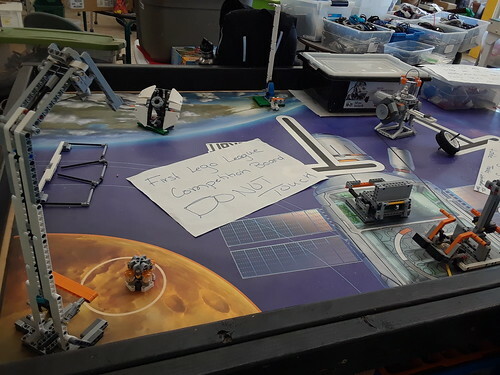 Here are a couple of shots of the First Lego League table that was used to practice for local competitions. 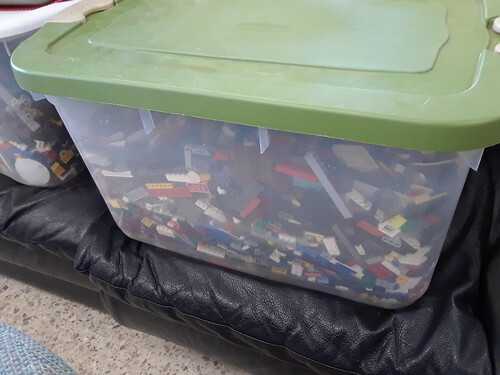 The First Lego League team have decided to continue holding its meetings in the home of one of the team’s organizers. 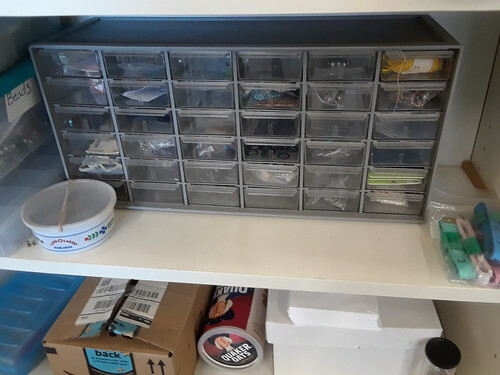 Here’s one of the cabinets which stored numerous things that were used at the makerspace. 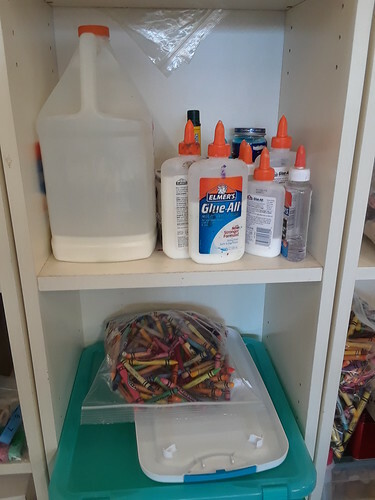 There was a shelving unit which held various arts and crafts supplies like paints, yarn, needles, buttons, beads, lace, pipe cleaners, glue, etc. 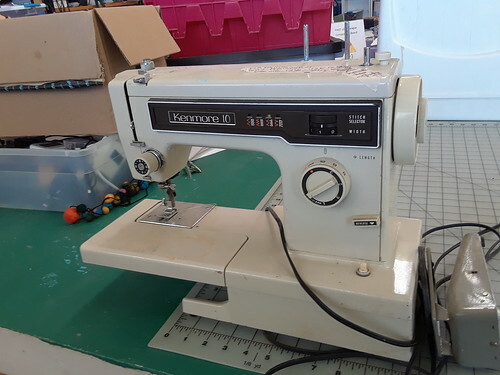 There were a couple of sewing machines available for anyone who wanted to try a sewing project. Even the bathroom had an interesting decor. 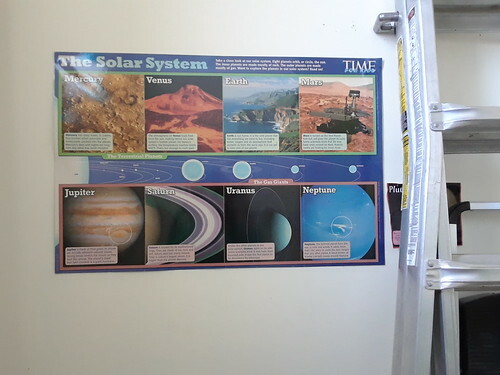 There was a poster where one could learn about all of the planets of the solar system while sitting on the toilet. 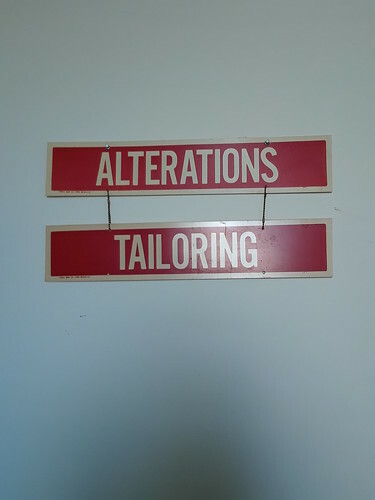 The bathroom also had these signs that were holdovers from the days when the dry cleaning business operated in that space. A few nights after I shot the other photographs I took one final photo of the place when I showed up to the weekly Fiber Fans meetup that was held at the Greenbelt Makerspace. 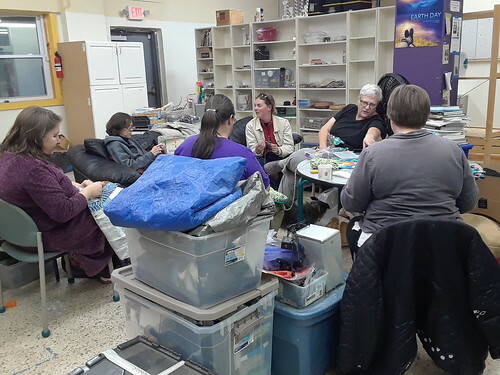 Since then the Fiber Fans have moved their meetup to the nearby New Deal Cafe (which is located across from the Greenbelt Makerspace’s former location). 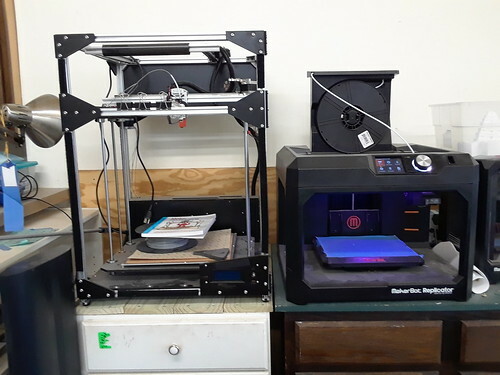 Even though the Greenbelt Makerspace no longer has a bricks and mortar space, the board of directors are trying to find ways of somehow keeping the Greenbelt Makerspace alive. 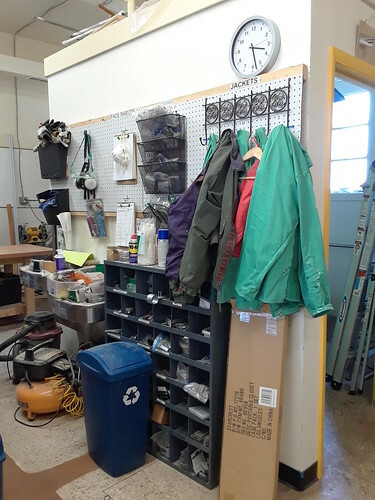 All I know is that over the past few years I’ve seen other DC area makerspaces like TechShop and Catylator Makerspace close down permanently so I’m hoping that the Greenbelt Makerspace could somehow be revived in a new form in the future. 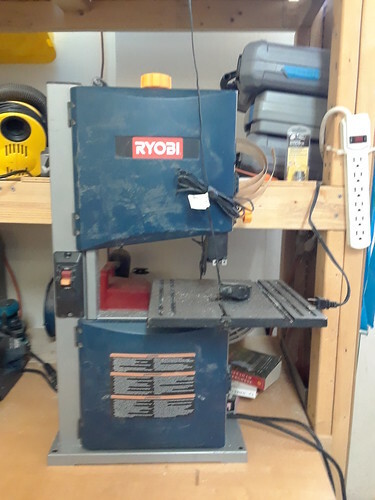 Ever since its original opening in 2013 I’ve written several blog posts about this place covering such events as the Repair Cafe, Build Your Own PC Workshop, and other events. 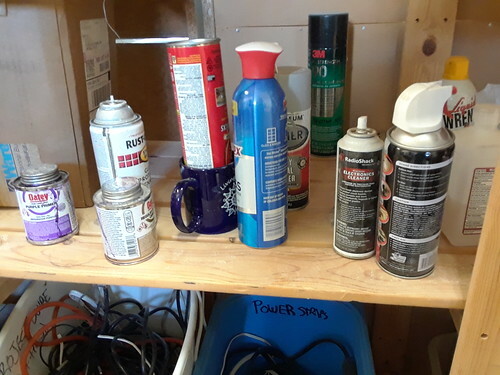 In case you’re curious as to what the place was like in its prime, here are some links to old blog posts and photos that you can check out. Last month I happened to come upon some hidden art that was located along the permitter of a parking lot in Takoma Park, Maryland. But on a more recent return trip to that same parking lot, I came upon some more hidden art that I hadn’t noticed earlier. It’s another sculpture and it’s literally located just a few feet away from the other art that I previously wrote about. This sculpture depicts three children sharing a book while sitting on a log. 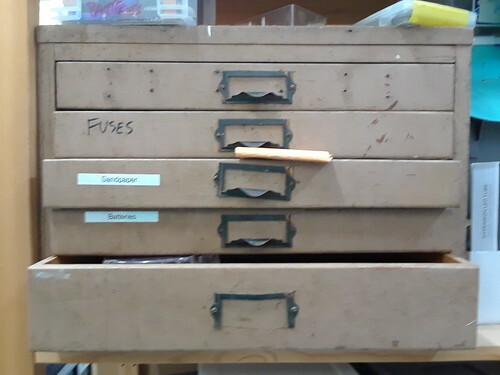 Coming upon these hidden surprises is a great fringe benefit of working in Takoma Park. Along with seeing poetry displayed on the street, such as the one below. 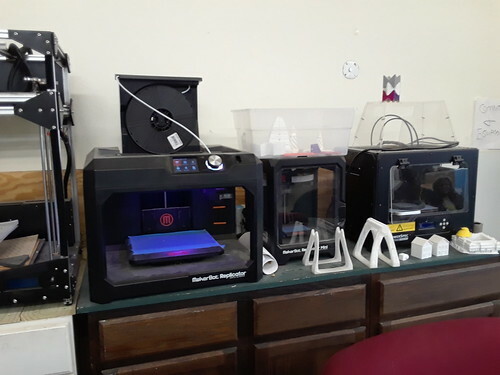 Every time I go over to The Space (a makerspace located inside of Beltway Plaza Mall in Greenbelt, Maryland) there always something going on. 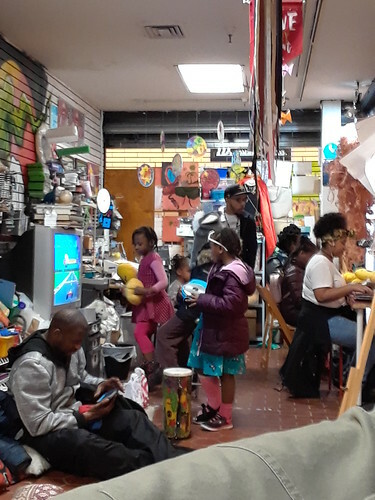 When I went there on that day I saw people of all ages doing things like playing video games (on vintage systems like the Nintendo Gamecube) and decorating emoji pillows. 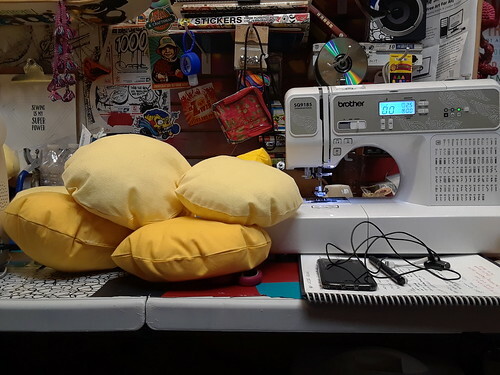 A group of recently sewn blank pillows are waiting for people to draw emoji faces on them. 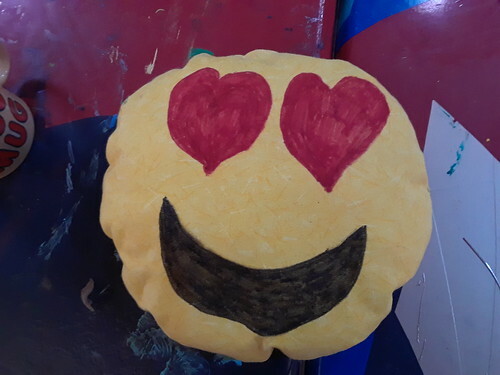 People of all ages decorated the pillows by drawing emoji faces with markers. 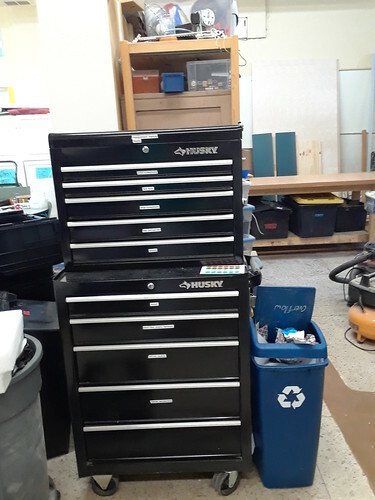 I got into the act myself. 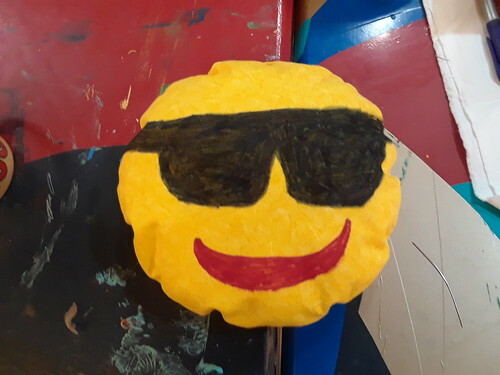 I did a two-sided emoji pillow. I used markers to decorate my pillow. It was the first time I ever did this. I’ve since done a St. Patrick’s Day-themed emoji pillow, which I already wrote about on that holiday. 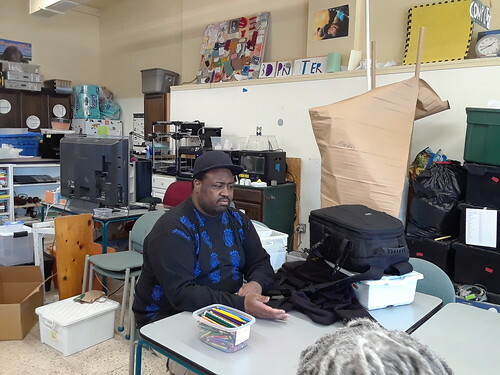 While all this activity was going on, Shaymar Higgs, the founder of The Space, was shooting a promotional video that will be used as a fundraiser for the nonprofit makerspace. One night when I was returning to my car after working at my day job I noticed this house had its lights on. At first I thought that the people living in that house had simply never gotten around to taking down the Christmas lights until I got a closer look at it. Upon closer inspection I realized that the house didn’t have Christmas images on the outside. The house was decked out with butterflies (complete with animated wings) and a dragonfly. Topping that display was an owl that was located outside of what looks like the attic of the house. 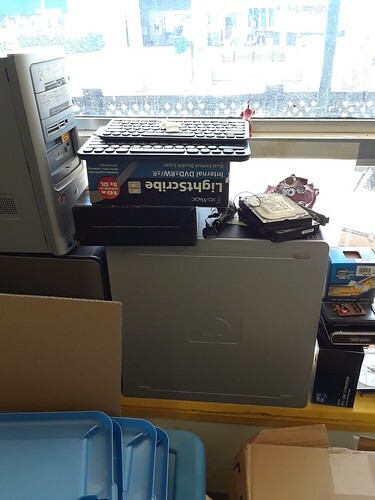 I have to admit that display is different. It’s also seasonal since spring is starting to arrive. Here are a few appropriate photos for today that I took over the past few weeks, starting with this house in Takoma Park that has lit shamrocks in the windows. I also saw a couple of inflatable leprechauns along with more shamrock images at a local Wegman’s. Yesterday I did some grocery shopping. First I went to Aldi, where I found this mix for Guinness beer bread where all you need to add is Guinness beer and molasses—both of which I already had. In the past I’ve baked Guinness beer bread from scratch using this recipe but I decided to be lazy this year and give the mix a try. If I end up not liking it, I can always make the other beer bread using that recipe at a later date. After I went to Aldi I headed over to Giant because I needed a few items that Aldi didn’t have in stock. While I was there I saw that Tastykake had a special version of its Snowballs snack cake which had green icing instead of the usual white icing. I bought it on impulse and I’ll probably end up eating it for dessert after dinner tonight. 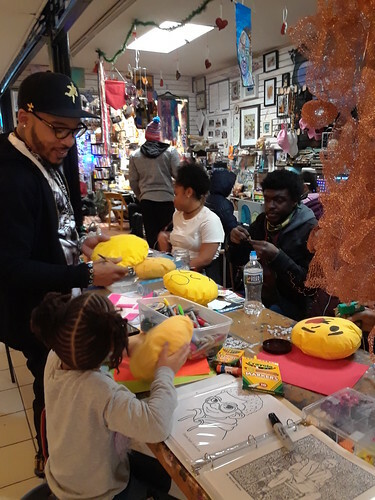 After I shopped at Giant I headed over to The Space where that makerspace had some small blank circular pillows where people can draw emojis on them. I decided to draw some Irish-themed emojis since it was close to St. Patrick’s Day. Here is one side of the pillow. And here’s the other side. 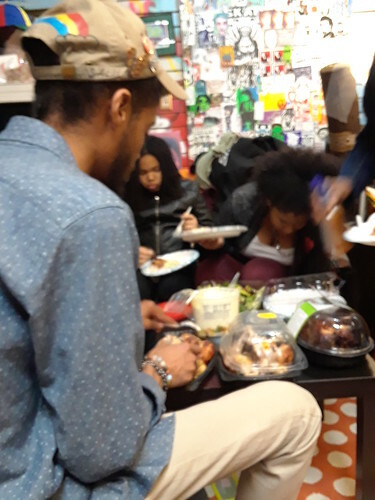 I briefly stepped inside of a Mardi Gras party (which actually took place on the Saturday before the actual day itself) that was held at The New Deal Cafe in Greenbelt, Maryland. When I arrived I saw that the bartenders were dressed for the occasion (even though it doesn’t seem to show in the photographs I took because it was dark inside). Little Red & the Renegades performed on stage that night and they got a lot of people dancing. I even shot a short video of the band, which should give you an idea of what they sound like. I didn’t stay too long because it was crowded inside. My car was parked over by the Co-Op Supermarket (which is located across from The New Deal Cafe). As I was walking past the doors, I saw a dog tied to a tree nearby wearing a lit necklace. That canine looked like he was ready to do some Mardi Gras partying himself. 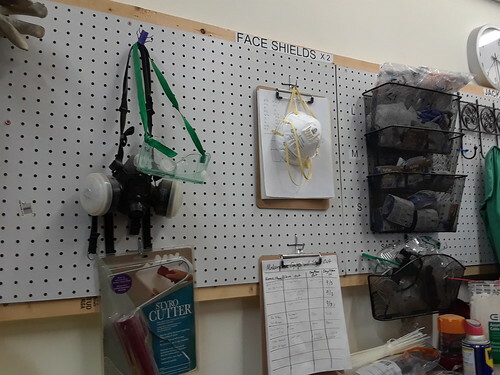 I recently stopped by The Space, a makerspace located inside of Beltway Plaza Mall in Greenbelt, Maryland. I arrived just in time for a free chicken dinner. A generous donor decided to donate a chicken dinner that came from the nearby Giant supermarket. The meal was very delicious and everyone appreciated what this donor had provided (including me). 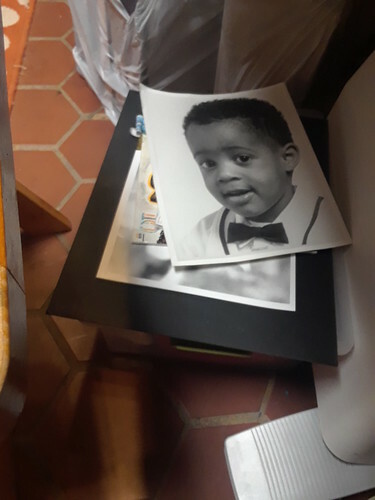 This last photo is a headshot of The Space’s founder, Shaymar Higgs, when he was a child. 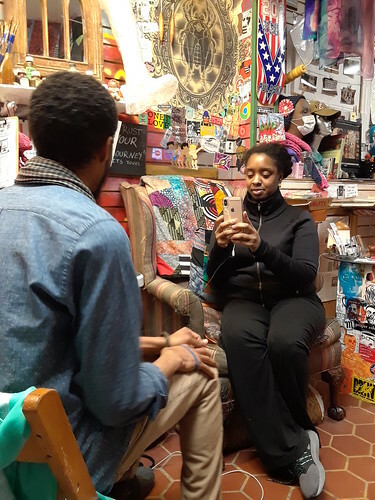 I arrived at the monthly Campfire Sessions, a musician showcase that is held at The New Deal Cafe in Greenbelt, Maryland on the last Wednesday of each month. The Campfire Sessions is hosted by Joey Campfire, who is part of the duo The Bachelor and The Bad Actress. Here he is introducing the next act that night. I arrived late so I missed the first act, Jer Swaby. I saw him at a previous Campfire Sessions last year where I even shot a video of his performance. I managed to arrive in the middle of this performance by Matt Severson. At one point he switched his acoustic guitar for a bass guitar. The final act on the bill was a keyboard player known as Jacqueline Pie Francis. Here’s a short video I shot of Matt Severson and Jacqueline Pie Francis performing their music. Enjoy! 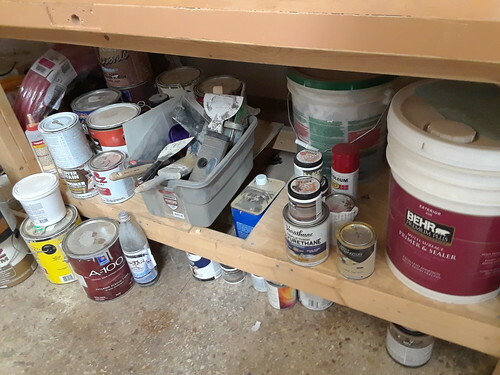 Walking around Takoma Park, Maryland provides all kinds of visual treats, such as what I found along the perimeter of a parking lot located behind the stores on Carroll Avenue. It’s called Giardino Joe Urciolo (which is Italian for Joe Urciolo Garden) and it’s pretty small for a garden. But it serves as a nice example of what one can do with a tiny amount of green space.